Taking a ride on the road? Don't forget these! Driving has become a part of our everyday routine. It's quite hard to move around in the city without a bike or a car. With traffic increasing each day, reckless driving on the rise, one needs to be careful on roads. Before you leave your home, make sure you have these in your vehicle to avoid unforeseen events. Following traffic rules can help avoid many accidents. Avoid over - speeding, avoid over - taking from the left and use indicators before taking a turn. Leave home early and be prepared in advance to drive calm and safe. 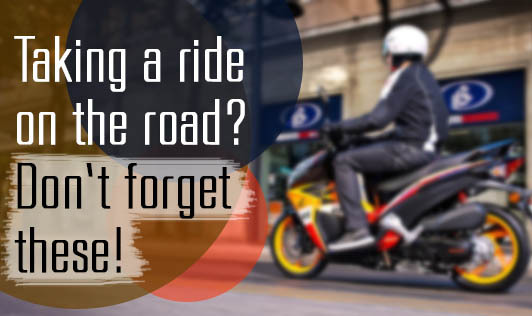 If you are riding, kindly avoid plugging in your ear phones, as you may not be able to hear other vehicles (especially ambulances), people on the road or even know if there is any emergency around. Take care when you're on the road. Always stay alert and anticipate moves by other vehicles. Drive safe.